The Royal Pavilion was the creation of George, Prince of Wales, later to become the Prince Regent. 'Prinny', as he was known, was a larger than life character, given to excesses of drinking, eating, and general carrying-on. One of his excesses was the Royal Pavilion at Brighton. The Prince purchased a farmhouse near the sea at Brighton and commissioned architect Henry Holland to create a neoclassical residence. Holland's house was known as the Marine Pavilion. 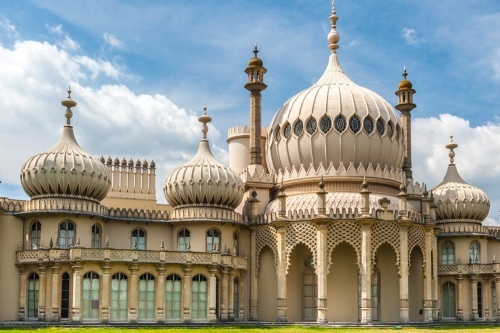 In 1815 the Prince Regent hired John Nash to expand the Marine Pavilion and create an Indian pleasure palace, with Eastern domes, turrets, and minarets. This Nash did, over a period of 8 years. Rather than tear the Marine Pavilion down and start again, Nash built a cast-iron framework over and around Holland's house and built his glorious new design onto the frame. Unsupported legend tells that there was also a hidden underground passage connecting the Royal Pavilion to the nearby house of Mrs Fizherbert, whom Prinny had secretly married. Though this legend has no apparent basis in fact, the story persists. There was indeed a secret tunnel, but it led to the nearby stables, now the Brighton Museum. As grand as Nash's finished building looked from the outside, the quality of construction was very poor. The roof leaked, and the drains didn't work properly. But, oh, my, it was grand! The word 'opulent' was made for the Royal Pavilion. The interiors are a feast for the senses, with lavish rooms decorated in lush Chinese style. Gilded decor featured Oriental symbolism, palm trees, and even a mock bamboo staircase. The interiors are set off with many items of furniture on loan from Her Majesty the Queen. Among the major rooms on view is the Music Room, lit by nine large chandeliers shaped like lotus flowers. The walls are decorated with canvases by Frederick Crace, one of Prinny's favourite artists. Perhaps the most luxurious chamber is the Banqueting Room, with extraordinary painted decoration by artist Robert Jones. The walls are covered with painted scenes from Chinese domestic life. There are several royal bedrooms on display, including Queen Victoria's Apartments, used by the queen between 1837 and 1845. The Yellow Bow Rooms are bedchambers used by the Prince Regent's brothers, the Dukes of York and Clarence. The King's Apartments are ground floor chambers decorated in a more subdued fashion than the rest of the Pavillion. This suite of rooms was placed on the ground floor for the comfort of the Prince Regent, who had become extremely stout and suffered from gout, making it uncomfortable for him to mount the stairs. Other rooms on display include the Long Gallery, which provided an informal area for recreation, playing cards, and music. And finally, there is the Great Kitchen, a massive chamber supported on four cast iron columns. The Royal Pavilion is set in landscape gardens design by John Nash to complement the house. Recent garden restoration has seen the replanting of species known to have been used in Nash's original gardens. Ongoing restoration work has returned much of the interior to the decorative schemes that were used when the Prince Regent was in residence. We would love to share photos of the Royal Pavilion interiors, but unfortunately photography of the opulent interiors is not allowed. Just take our word for it; the interior is simply astonishing, incredibly opulent, and utterly amazing.